These one-alls are 100% cotton knit. This knit fabric is the highest quality available. Visit the graphics page to select your graphic. 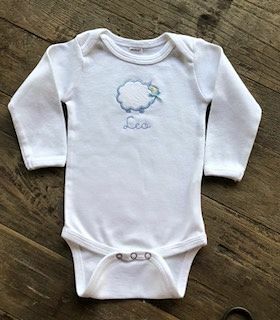 Pair this one-all with a matching burp and bib set! Each one-all is wrapped in tulle and white satin ribbon. Â©2010 - 2019 Southern Threads. All rights reserved. Powered by merchantmoms.com Web Design by BoutiqueMama.